Tents like anything else have a myriad of choices. When you walk into a shoe shop, you are greeted with the options of brown or black, suede or leather, heels or flats, opened or closed - you get the picture. Just as you have many options with shoes, handbags and watches, so is the same for tents. What is the event I’m planning for? Is it a comfortable location for me and my guests? After you would’ve figured out these key factors, you’re ready for the next step - finalizing the decision. The number one question customers ask when tent shopping is ‘What size do I need?’. Common factors that usually determine the size of tents are the type of event being held, the amount of space needed and number of guests. If, for example, you are planning to host a wedding shower of 60 people, with seating only, you will need a 20’ x 30’ 600 square feet tent. If extra space is needed for a bar and buffet set up, you’d need a 20’ x 40’ 800 square feet tent. The bigger your guest size, the more space you will need and the larger your tent should be. At any event you host, you want to ensure your guests are calm, cool and collected. Considering other variables like air conditioning units and sidewalls when searching for the right tent for your event is key to guest comfortability. We retrofit tents for clients within many different options. The most common accessory offered, sidewalls, come in many different styles such as white, clear, glass or cathedral windows. For clients that may not want their guests (particularly ones that wear heels) walking on uneven surfaces, we provide various flooring options with carpet or wood finishes. No need to stick with traditional tent styles for your event. Get creative with your options and go for a style that best suits the occasion. 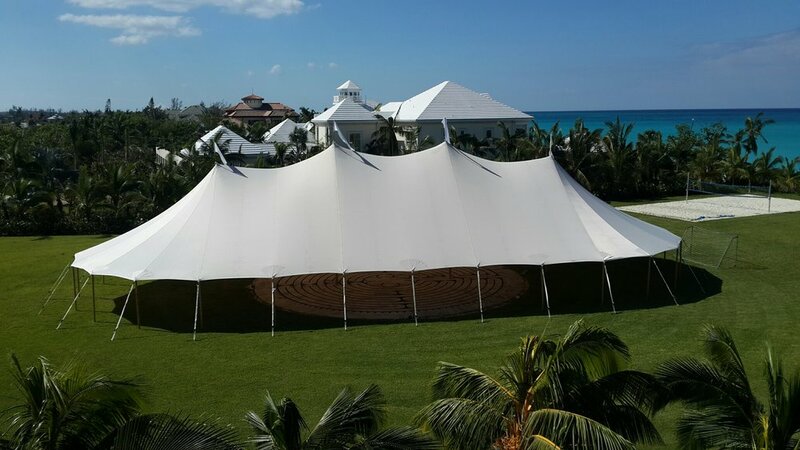 Clear top tents are most popular for evening events like weddings and receptions because it allows for guests to take in the beauty of the night sky without feeling the heat or random drops of rain. Sperry tents, which are fairly new but have been well received on the market, are translucent and offers a glowing effect when lit at night. You can also opt for the peak tent which is a “step up” from standard frame tents if you want something a bit more elegant without having to “break the bank”. And by ‘dress’ we mean decorating your tent with the right elements to get the event going! Just as a birthday party needs a birthday cake, so does your tent need to enhance the overall look. Our decor partners offer supplies like drapery, centerpieces, lanterns, backdrops and the likes to spruce up your event and tailor to its specific occasion! Tip #5 - Location, location, location! Above all else, when searching for the right tent, it is important to consider the location of your venue. Ask yourself: Is the ground leveled enough to accommodate tenting? ; Are there any underground utilities such as irrigation that may prevent installation? ; Is there enough space for installation? If you’re unsure of the answers, we can offer our guidance and perhaps rethink the location since it can affect your overall experience. If you are sure, you're well on your way to planning a successful event! To find out more about the various tent types and styles we carry along with our other products and services, check out our Catalogue. If you're interested in a product or service, add it to your Wishlist and check out when you’re ready for purchase. If there are any further questions or concerns, feel free to leave us a message in the Contact Us section of our website, send us an email or give us a call. We’ll be happy to accommodate in whichever way we can.